it’s easy to get caught up in social media, and the exciting lives it appears to perpetuate. if you look at my instagram from last week, it looks like i had fun times in san francisco and seattle and la, when that’s not quite true (there are most certainly no pictures of me getting up three times in the span of 5 hours in the middle of the night to puke, or the hours trapped studying sql queries). i store pics for a looong time, so you’ll be seeing seattle content on instagram for months to come, though i won’t physically be there when i post. despite knowing this, i forget and sometimes get jealous over other people’s latergrams. even though i know i don’t see the struggles and hard work in the background, and i’m envious over the fluffy things. but this furikake chex mix isn’t something you should be bitter about. it’s much easier to attain than an all-expense paid trip to hawaii, and much easier to share with all of your frans (read: friends). you get furikake chex mix, you get furikake chex mix, everybody gets furikake chex mix!!!! (doesn’t quite have the same ring as the og but you get the idea). 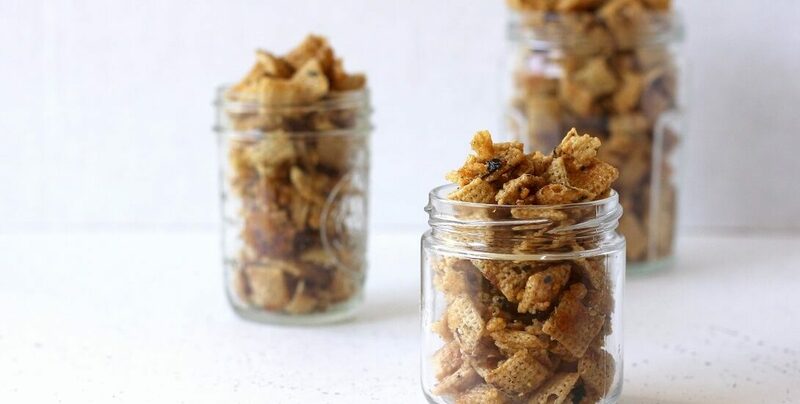 if you’ve only had the chex mix from the bags that are super salty and crunchy (i say this in the best possible way), then you need to make this. it doesn’t have those brown chips, which doesn’t upset me, since i don’t care for them anyways, but you can add whatever you like. i personally like it with just cereal, but you can add nuts or popcorn or whatever you fancy. it’s a really simple snack OR holiday gift (see part 1 in my two part holiday food gift series: cherry almond croquant). so simple that a pre-teen could make it, as i did for my twelfth birthday party (along with spam musubi and lemon cupcakes topped with swiss meringue buttercream and gumpaste sandals from elisa strauss’ confetti cakes cookbook; yes i was extra even then). melt butter with soy sauce and corn syrup, then stir it into a couple of boxes of cereal and your favorite furikake. * spread it out on a baking sheet and send it into an oven for some crisping before final consumption (though it doesn’t hurt to taste a bit before it goes into the fiery depths). baking it really makes sure that the furikake chex mix dries out and crisps up properly. *furikake is a japanese condiment typically made with shredded seaweed and other flavorings that’s typically used for rice. you can find it in any asian market. there’s a number of different varieties, including ones with umeboshi (pickled plum) and crunchy rice balls. my favorites include the simple goma (sesame seed) and bonito (fish flake) ones. the resulting furikake chex mix is kind of salty and kind of sweet. the savory, briny, sesame-y furikake balances out that sticky, caramelly brew used to force the furikake to cling to the cereal. and you get left with a snack that’s impossible to stop eating, bar giving it all away. 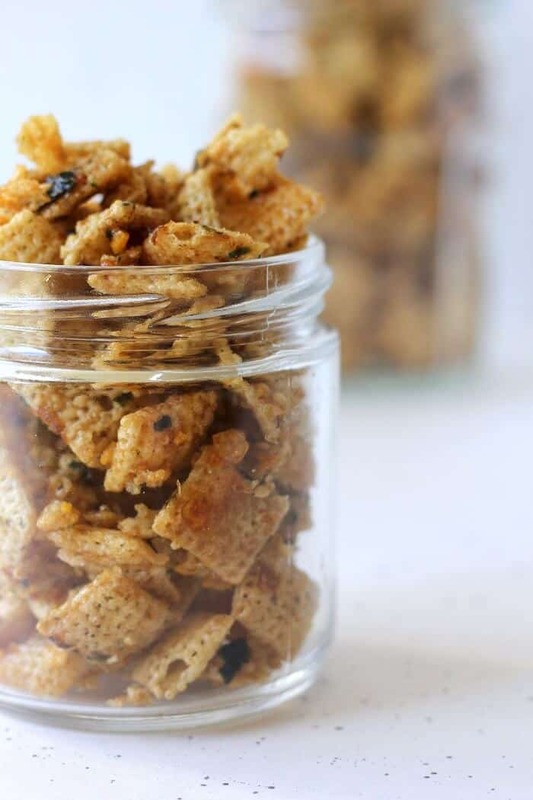 Furikake chex mix is an Asian American twist on the usual chex mix, and features the Japanese rice condiment furikake, made of roasted seaweed and sesame seed. Heat all syrup ingredients in a pot over medium heat until the sugar dissolves and the butter melts. Put the cereal in a large (wide and shallow is better than deep and skinny if you can find it) bowl. Recruit an extra set of hands, or prepare to pick up and put down different things a bunch of times. While continuously tossing with a heat-proof rubber spatula, drizzle the syrup all over the cereal, pausing occasionally to sprinkle on some furikake. Even coverage is the key here. Spread the mix on a foil or parchment lined baking sheet. 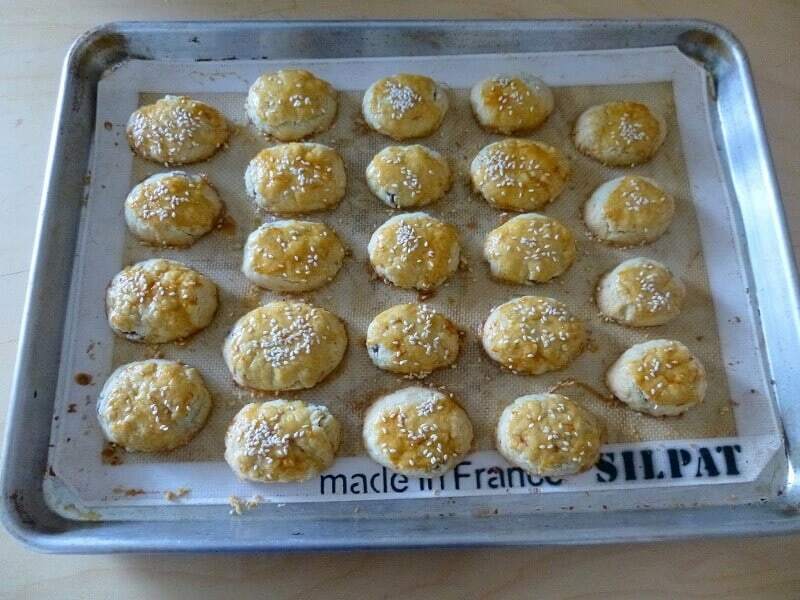 Bake at 250F for 1 hour, then cool before breaking into bite-sized pieces. It will crisp as it cools. Store in an airtight container at room temperature. Well I’ve never heard of furikake so i need to go find out what that is! Wow!! That sound YUMM!! I have never heard of Furikake, and I doubt if I can find this anywhere in India.. But I am surely going to try because I think this is too delicious to not try!! 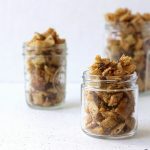 Crunchy, sweet and salty..Perfect for snacking! Sounds like an interesting combo! I love furikake, but I don’t love corn syrup, so I would probably sub that out for honey 🙂 I might have to make some for Christmas snacking! This is absolutely GENIUS Heather! I can so totally see how the saltiness of the furikake would pair perfectly with the sweetness of the syrup. I’m thinking sesame salt furikake would be a particularly exceptional variety to try with this 😀 It’d look so cute tucked into the corner of a bento box too, ahh so excited! 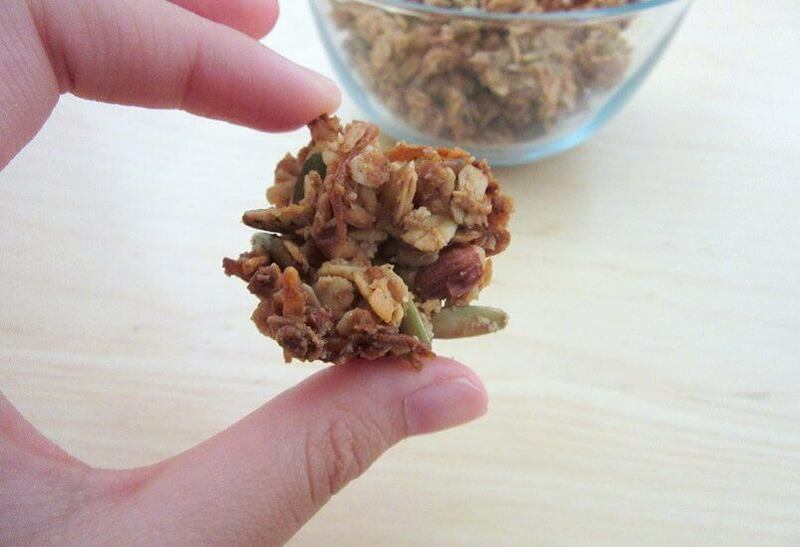 I love this twist on the Chex Party Mix! I totally am intrigued by this flavor 🙂 Have a great week!! I’m curious about Furikake! I’m sure I would like it, from what I’ve read and I’m a total chex party freak! I’m gonna have to step it up, perfect for New Year’s I think! 🙂 Thank you Heather! Heather, this sounds delicious – anything salty and sweet, I’m all in! I have to say, the brown chips in chexmix are my favorite part, so I might just have to hunt them down for the sake of including them. Also, I’m happy to know a little more about furikake. It’s always beeen a bit of a mystery. So thanks! i’m trying to remember if i’ve ever seen the brown chips sold separately, and i don’t think i have. but they sell bags of just lucky charm marshmallows (sans cereal) online, so they must be available somewhere! THIS is a combo I would have NEVER even thought about for a second! But it does sound intriguing and I do love me some sesame seeds! i feel like the term “fusion food” gets a bad rap in some circles, but it’s (usually) pretty good. best example i’m thinking of right now is mexican + korean. kimchi quesadillas are so good!!! (highly recommend trying it out if you haven’t yet). YUM! I’ve never even heard of furikake before, so I’m totally intrigued too! I love fusion food and this sounds redonkulously good! Hope you did well with your finals! I usually have mixed feelings about latergrams but if it makes the poster happy, I am 100% for it! I’ve never heard of furikake chex mix before but sounds like something I’d enjoy! I like how easy the recipe is! You’re making me crave some chex mix XD. i like posting latergrams because i get a chance to remember my experiences again (: and furikake chex mix isn’t really sold in stores, so unless you somehow get someone to make it for you, i feel like it’d be hard to find out about it! I am like you, I keep my photos for ages so that I can share them and reminisce at the same time. SO right!I think Mrie Forleo has got a guest talking on the show today about instagram envy. SO watching that. yes so addictive! it’s crunchy and salty/sweet so i eat handfuls at a time. It’s so hard not to get caught up with social media. I actually love going off the grid for a few days just to clear my brain of it all!! I actually do not know if I can make this chex mix…ever…because I would EAT IT ALL in one sitting!!! Ohhhh… so savoury and sweet! I love furikake. Plus, I have all the ingredients on hand right now. I need to make this right away. I am sorry you were sick on your trip!! I hope you are better now! Haha amazing I heard Opera as soon as I read the chex mix line haha! I have never had chex mix before but I see it in American movies and I WANT IT! This is such a cool recipe heather. they don’t have chex mix in australia?! guess it’s time for you to make some yourself (; or hunt some down on your travels/online! I have never had furikake, but the recipe sounds fantastic, so I would love to try it. Ouch- sorry you were sick on holiday. I haven’t used furikake before but it sounds perfect for the salty cravings. Pinning this recipe! Oh this sounds so good, I love new and interesting snacks to munch on, this looks so addictive! Oh you. You really know the way to my heart, don’t you. If you need me i’ll be sitting in front of the TV hoarding a huge bowl of this crispy goodness with good ol’Netflix. ..and honestly, I totally hear you about social media. I swear I have a love hate relationship with it but if I knew how to show you my onesie wearing, messy bedhead (24/7), video gaming – farting ways through it – you betcha I would, but only if I can make it look incredibly beautiful. 😉 HA! mmmm yes! i don’t even need tv, just a bowlful at the table, but this would definitely be a good tv snack. and ahhhh onesies sound so cozy! it’s ridiculously hot in southern california (it feels like spring but we are smackdab in the middle of winter…), so maybe i’ll seclude myself up in the mountains for a weekend and then buy a onesie.